It's a Football Friday rant: Oh, bravo, Pro Set. It was so important to get young Don Beebe in your 1989 edition that you had to reach out for a third-party photo, was it? 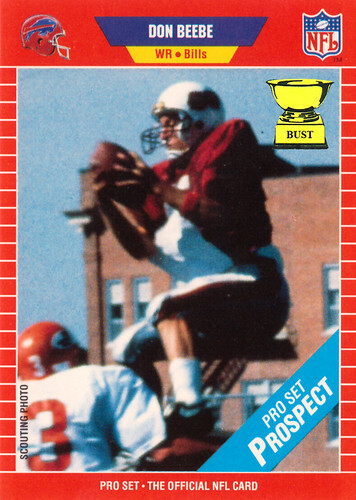 Only, rather than track down a quality picture of the young receiver, you acquired what appears to be a lost image from the Zapruder tape and slapped it on this piece of cardboard. Thankfully, you credited it as a "scouting photo," lest we be concerned that your oh-so-rigorous standards were slipping. Congratulations, gentlemen, your focus on quality is as sharp as ever.